Douglas Thomas and Temilola Alanamu. 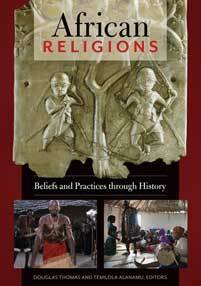 African Religions: Beliefs and Practices through History. ABC-CLIO, 2018. ABC-CLIO, publisher.abc-clio.com/9781610697521. This book supplies fundamental information about the diverse religious beliefs of Africa, explains central tenets of the African worldview, and overviews various forms of African spiritual practices and experiences.